Are you considering transitioning your world language program from a traditional one to an oral-proficiency based one? In this blog post, I will share the basic steps that we, the University School of Milwaukee in Milwaukee, Wisconsin, have taken to make such a shift in the last few years in our PK-12 World Language department. First, since we knew the shift to an oral-proficiency program would not be an easy one, we hired a consultant to guide us through the process. If you can prioritize this in your budget, I highly recommend it. Department members may have more confidence in the process when an expert and outside consultant leads rather than a department chair who may have no particular expertise in developing an oral-proficiency based program. With the help of our consultant, we became familiar with the basic terminology of the American Council on the Teaching of Foreign Languages (ACTFL) proficiency guidelines. For example, we began to learn what defines Novice, Intermediate, and Advanced level speakers. 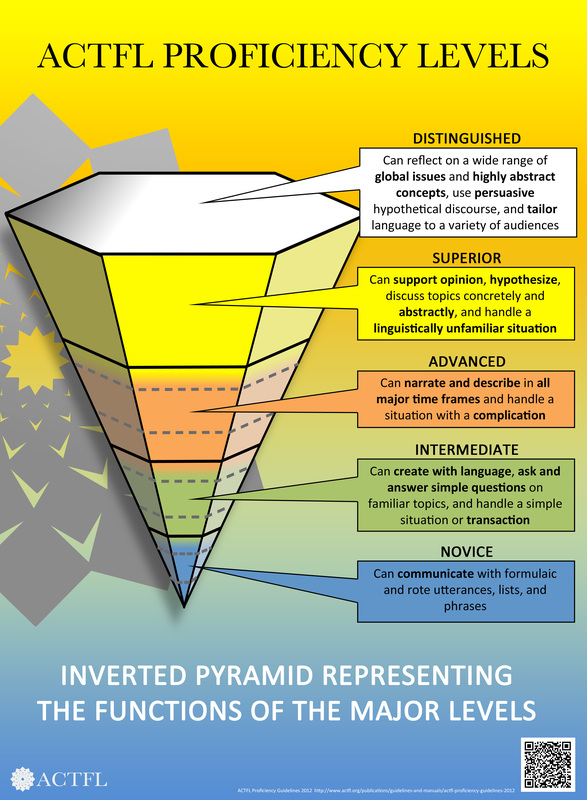 Even though we were familiar with this terminology, it wasn’t until we were all deferring to an expert that we began to understand more fully what they meant with regard to the oral proficiency of our students. Our disparate teaching techniques began to align, and soon we found ourselves using the “same language” to describe our goals for the program. Our consultant then spent two days with us reviewing our current program. While we all thought of ourselves as experts in our fields with master’s degrees, we were surprised to learn that generally, we were not truly manifesting many signs of being an oral-proficiency based program. We had the opportunity to work with our consultant to learn what we might do to move toward the goal of shifting the focus of our program from textbook and grammar-based teaching to oral proficiency-based teaching. Next, our whole department participated in a two-day MOPI training workshop through ACTFL on our own campus. We lined up 6-interviewees who were learning English so that we could all learn and practice the interviewing techniques used to determine our students’ oral proficiency level. When the trainer offered the opportunity for certification following the training sessions, we all agreed to prioritize seeking financial support from our administration to complete it. To have all of us tackling the certification process was our single best decision toward accomplishing our goal to become an oral-proficiency focused department. Each department member started on the road to mastering the oral proficiency interview as a means of setting targets for all students in our language program and learning how to assess them uniformly. We now had, not only a common goal, but common language and a method for assessing our students’ oral proficiency. With the help of our consultant, we began to consider the idea of abandoning our textbooks in order to begin creating a more engaging curriculum based on a set of themes that we might cover PK-12. Since we have an AP language program in French and Spanish, we chose the AP themes (Beauty and Aesthetics • Contemporary Life • Families and Communities • Global Challenges • Personal and Public Identities • Science and Technology). We found them general enough to allow for most any area of study we wanted to pursue with our students. After two years of curriculum writing, we can honestly say that it has been a somewhat chaotic and challenging process. With patience and perseverance, each year we are able to develop our units more thoroughly and sequentially, continuously improving the path to proficiency for our students. At the recommendation of our consultant, we began testing all our students with a Standards-based Measurement of Proficiency (STAMP) test for the first two years and The ACTFL Assessment of Performance toward Proficiency in Languages (AAPPL) test this past year as one means of benchmarking our progress with building oral proficiency. These tests are far from perfect, but we are committed to having an objective way of assessing our students. After analyzing our AAPPL test results this year for each student and comparing them to our live individual MOPI interviews, we have found that the combined results best help us to pinpoint the oral proficiency level of our students. Since our initial consultant advised us that the transition from a traditional textbook-based language program to an oral proficiency-based program would take three to five years, we are comfortable with the fact that we have more work to do. Next steps for us will include sharpening our teaching skills in developing oral proficiency (Fall 2017) and renaming our courses according to oral proficiency levels (Fall 2018).We have hired the ACTFL Teacher of the Year 2016, Katrina Griffin, to do a 2-day hands-on workshop this fall to give us more tools in developing our students’ oral proficiency levels. We, also, are researching the implications for college admissions in renaming our courses according to proficiency levels versus the typical nomenclature that indicates how many years a student has studied a language. Stay tuned to my next blog post to learn more about our mind-blowing experience in Singapore. One of the most important things Cris Ewell, elementary language coordinator at SAS, said to us, was: “It is not only about the amount of time your students have in the classroom learning language; it is crucial what you do with that time toward building skills.” This is motivating us tremendously to seek best practices in our classrooms toward the end of helping students to develop their oral proficiency. Moving to an oral-proficiency based program can be overwhelming and mind boggling, but we are excited about the skills that our students are developing as evidenced in our live oral interviews with them and their strong results on the AAPPL test. In future blog posts, I will go into more depth about assessment, standardized testing, curriculum writing, grammar conundrums, and some of our major takeaways from the Singapore American School. May I ask who you used for a consultant? My department has been wondering who to use. We used Helena Curtain-Anderson in 20110, but were not ready to make the change. More recently, we used Greg Duncan. They are both excellent. I am not sure if Greg is doing as much consulting now as he once did. Some of my colleagues in other schools have used Thomas Sauer more recently. We have Katrina Griffin, ACTFL Teacher of the Year 2016, coming in the fall to do a hands-on workshop. I understand that she is doing some general oral proficiency program consulting, too. Hope that is helpful! So helpful! I’ve done workshops with both Greg and Tom and learned so much! Hi Holly! Love the picture for this article! Too funny, LeAnn! You were not really into our conversation! Great sharing Holly! Don’t forget other important factors your school has–committed teachers, strong leadership, supportive Administration and patience, all focused on a common goal: your students’ proficiency! Great post Holly! Thank you for sharing. Can’t wait to hear more about your experience in Singapore.